When a full moon fills the night sky, P I Roman Dalton becomes a werewolf and prowls the dark streets of the city battling creatures of evil. 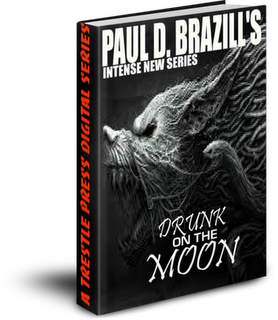 Paul D Brazill's Drunk On The Moon is an intense and hard-boiled noir / horror series, brought to you by some of the finest dark fiction writers around, including Vincent Zandri, Julia Madeleine, Benjamin Sobieck, Richard Godwin, Katherine Tomlinson, Frank Duffy, B R Stateham, Jason Michel, John Donald Carlucci and Cormac Brown....and not to mention PDB himself. For those of you unfamiliar with PDB's writing...where have you been? Spinetingler Award nominee Paul D. Brazill was born in England and lives in Poland.His stuff has appeared in loads of classy print and electronic magazines and anthologies, including the 2011 Mammoth Book Of Best British Crime. His short story collection '13 Shots Of Noir' will be published in 2011. He writes a column for Pulp Metal Magazine and contributes to Mean Streets Magazine and has won a legion of readers at his blog 'You Would Say That, Wouldn't You?'. Paul is the kind of noir/crime fiction/hard boiled/mystery/horror/humour writer who makes others jealous of his inimitable style (yep, and that includes me). Some have even dubbed him the 'Noir Bukowski'. Add to that he's also a great guy who selflessly promotes and supports other authors' work. Drunk on the Moon is Paul's brainchild - a series of ebooks from Trestle Press - that follows his main character Roman Dalton - Ex-Detective, Current Werewolf - through the Sin City-ish landscape of 'The City', and it is a great, rollicking fun read, full to the brim of Paul's usual gritty noir, northern humour and fiendish horror. But PDB being PDB, he didn't want to keep all the fun to himself. he opened the floodgates to other top authors in the field, and future editions of the ongoing series will be penned by those illustrious names above. More will likely join the ranks. I intend being along for the ride (reading the editions as they come out at the very least). 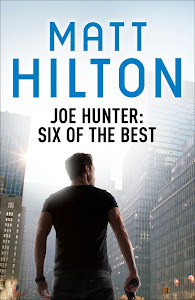 You can get the first part of the series here at Amazon UK for only £0.86. or at Amazon USA for only $1.38.